Blade feathering is the term for changing blade angle (pitch), and influences the blade's angle of attack. 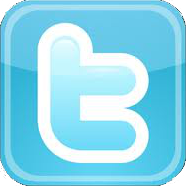 A blade feathers along its longitudinal axis, and a bearing is usually used to support this. The blade angle is set by the control rod, which is connected to the swashplate. Changing the blade pitch will result in a change in blade flapping behaviour. 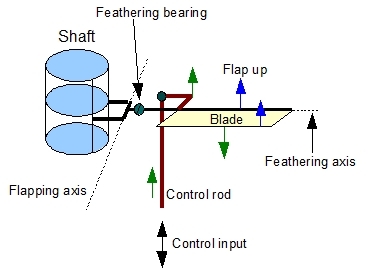 The place where the control rods connect to the blade, and the position of the flapping axis (for example, the position of the flapping hinge), both influence feathering and, therefore, blade angle. Take a look at the figure below. In this example, when a blade flaps up the blade angle will be reduced and vice versa. This causes additional blade flapping damping (which leads to a lower blade flapping amplitude). This configuration is also referred to as a 'delta 3 configuration'. 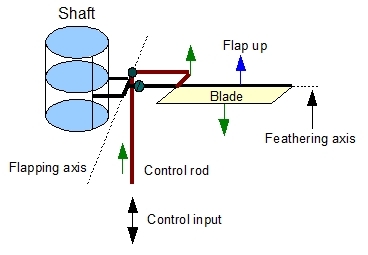 Blade flapping doesn't interfere with pitch angle when the control rod connecting joint lies at the flapping axis, as in the second figure below. Note that blade flapping is also dampened by aerodynamic forces. See Blade Flapping. The designer of a rotorhead has another way of reducing the flapping amplitude (creating more damping). This is achieved by utilising a construction in which the flapping hinge axis is positioned as set out in the next figure. In this configuration, when the blade flaps up, the angle of attack will decrease by construction. When the blade flaps down, the reverse will happen. This design is also referred to as a Delta 3 Hinge, and is often seen in tail rotorheads.